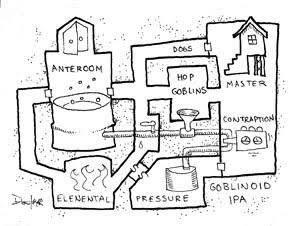 The joys of Dwarven Stout are well known, but Goblinoid IPA has its followers as well. It's a bit harder to find, as Dwarves brew Stout by natural instinct, whereas to force Goblins to create their brew in any quantity requires a powerful leader to unite them. Nevertheless, the occaisonal stash of hapily fermenting Goblin IPA has been enough for discerning adventurers to develop a taste for this rare treat. Just don't ask what ingredient gives it that distinctive citrus tang. Obviously it's the dry-earing, once it's in the firkin you add a generous handful of elf ears.